COYHAIQUE, Chile  The Carreterra Carretera Austral is a lonely place. Its 750 miles of washboard rumbles south through thick Valdivian rain forest and across sprawling steppe, bound toward for the tip of a continent. But before it can arrive, its blocked by the Southern Patagonian Ice Field, the biggest chunk of continental ice outside of Greenland and Antarctica. Chilean Patagonia is also a land of water: its deep glacial lakes and powerful, pristine rivers rushing from the Andes to the Pacific. Its a dream if youre a salmon, a nature lover, or kayaker. Or a hydroelectric company. Energy is a hot topic in Chile, where natural resources are few. Ten Patagonian rivers are targeted for dams planned by Spanish-Italian multinational Endesa and Chile-based conglomerate HidroAysén, with the backing of the government. At stake are pristine ecosystems and rural farms but an even greater issue involves building the worlds longest transmission lines. Thousands of high voltage towers would run 1,500 miles  picture the distance between Maine and South Florida  to bring power to Santiago and, the capital, and mining operations in the north. Among the rivers high on the dam list are the Baker, the highest-volume waterway in the country, and the Pascua, so remote that few have people have ever seen it. According to Sanger, their ecosystems also include rare species like the huemul (South Andean deer), now numbering in the low thousands worldwide. Isolation has prevented environmental studies of the area. Driving the Carretera Austral, the Pascua is 14 hours south of the provincial hub of Coyhaique, crossing by ferry to Villa OHiggins, where Lake OHiggins is navigated to a remote, roadless point. As I jumped at the chance to see the river it occurred to me that my trip had a motive akin to a new form of tourism: seeing the sights while they still exist. Deep in the heart of the Chilean Patagonia, Cochrane is a drowsy hamlet of 3,000. The streets are quiet, save for the herding dogs happily corralling a handful of backpackers down sidewalks overgrown with yarrow. At the local beanery, alongside your salmon, mashed potatoes, and cherry compote, theres a rack of free postcards sponsored by HidroAysén. They run out fast, particularly the images of horse riders crossing rivers on wooden rafts. These idyllic scenes are the very ones at stake. Rosa Figueroa staffs a small tourist kiosk on the plaza where travelers can find campground information and get bus schedules. Patagonia forged its identity on sheep and cattle ranching. Before the Carretera Austral (Route 7) Austral was built in the 1980s, Chile encouraged colonists to occupy the land. But poor soil and the great distance to market still make it a tough place for ranching. As time passes, Patagonia veers from its agrarian past. Dueling philosophies are at work: construction as progress and construction as destruction. While virgin sectors of Chile are slated to supply raw materials, conservation projects aim to turn back the clock. The question is whether the future will see Patagonia industrialized or preserved for tourism. Kris and Doug Tompkins, conservationists from the United States, bet on tourism. After they created other model parks, such as Chiles Pumalín Park and Monte León National Park on the Argentine coast, Kris Tompkins set her sights on 173,000-acre Estancia Valle Chacabuco and purchased it through nonprofit Conservación Patagónica. It was a glorious property, featuring steppe, forest, mountains, lakes, and lagoons. But ranching 45,000 sheep and 4,000 cattle took its toll  never mind that the ranch had never turned a profit. Rehabilitation is reinstating the ranch as an important wildlife corridor. 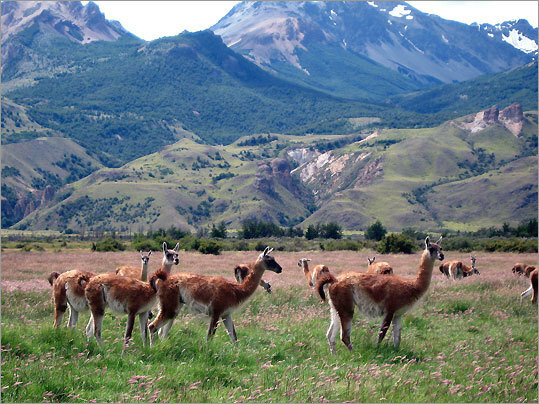 So far 400 miles of fencing has been removed so native guanaco (a wild relative of the llama) and huemul can return. Volunteer Wendy McDermott, a volunteer from Crested Butte, Colo., spent her vacation ripping fence line, removing sheep pens, and collecting grass seeds on the property. Chiles national parks system has already pegged Valle Chacabuco as priority habitat since it still harbors original species. The grand plan is to create Parque Nacional Patagonia by combining this valley with the Reserva Nacional Jeinimeni to the north and Reserva Nacional Tamango to the south. This would create a 600,000-acre national park that could rival the popular Torres del Paine, which draws nearly 200,000 visitors yearly. But, seeming almost a thumb in the eye to the Tompkinses, whose strict conservationist stance has alienated the pro-business sector, the first dam on the Baker River, which would inundate almost 5,000 acres, would be built at the entrance to Valle Chacabuco. At Valle Chacabuco, the lay of the land is wild. Flamingo-filled lagoons give way to tawny, sculpted hills and thick ñirre (Antarctic beech) forest that climbs to craggy peaks. With other wildlife watchers, I observe a pack of guanacos passing through burnished grassland that camouflages their feathery coats. One keeps watch, stretching his long neck to keep an eye on us interlopers. We saw foxes and flamingos, and strained to find Andean condors and vizcacha. (related to the chinchilla). South of Cochrane, the rough road shudders through landscapes of enormous granite buttes, columns of beech, and swaths of temperate rain forest. At Puerto Yungay, a ferry crosses the Mitchell Fjord. Among the passengers are long-distance cyclists, locals with their pack horses, road engineers, and a handful of travelers. The following daybreak, a catamaran motors out of Villa OHiggins to navigate five hours to the headwaters of the Pascua River. The boat is filled with dozing members of the Chilean Patagonia Defense Council (comprising organizations opposed to the hydroelectric projects), park rangers, and a handful of locals, all curious to discover what the Pascua holds. Lake OHiggins is the deepest freshwater lake in the Americas and even in the middle of the souths crippling heat wave the air is fresh and crisp. We plow past forested shores with glacial arms of the Southern Ice Field Patagonian Ice Field tumbling into the fresh cobalt waters. Zodiacs take the group to a virgin coastline carpeted in wildflower blooms. The hike to the riverbank forces us to bushwhack through thick brush and over twisted roots. A ranger identifies huemul prints stamping the meadow bottoms. We climb steep rock outcrops to get our first glimpse of our goal. The Pascua pulses and careens through a deep rock canyon, whirling in raging current and spurting straight into the air. Maybe its a blessing that it has been left unexplored all these years. For now, the Pascua is one of the most beautiful rivers on the planet, pale turquoise, vigorous, and alive. Carolyn McCarthy, a Chile-based freelance writer, can be reached via carolynswildblueyonder.blogspot.com. Travelers can access the Carreterra get to the Carretera Austral by means of from Lan Chile (lan.com), which flies from Santiago to Balmaceda, 34 miles 55 km from Coyhaique. Flights usually make a stop in Puerto Montt. Fares start at $298 round trip. In Coyhaique, Hertz (011 56 67-231-648, Av. Baquedano 457) rents cars. Volunteers help eradicate exotic plant species and take down fences and clean out plants to convert this former working ranch into a future national park. Contact Paula Herrerra Herrera at pherrera@conservacionpatagonica.cl. For a fully local experience, contact this Spanish-speaking Aisén agency that connects visitors with rural home stays, local hiking guides, and horse-riding excursions. Adventure outfitter offering ice trekking on the Exploradores Glacier. They also run a lovely family-friendly village B&B; (doubles from $117). Classic and comfortable, with Ccolonial stylings and the fresh smell of cypress. Guests enjoy garden dining in the apple grove or nights by the fireplace on red velvet armchairs. Doubles start at $59. Cabins on the forested shores of the Baker River. Guests enjoy personalized attention, homemade desserts and jams; massages are available. Doubles start at $85 with breakfast. Modern cafe with heaping bowls of greens and hearty Patagonian stews. Entrees average $6-$10. Live music on weekends.